We have known for quite some time that Kong: Skull Island will further help set up Warner Bros.' Godzilla and King Kong franchises, with a post-credit scene that includes monsters King Ghidorah, Mothra and Rodan. That scene directly leads into 2019's Godzilla: King of Monsters, which will then connect to 2020's Godzilla vs. Kong. While the future of these franchises are certainly bright, Kong: Skull Island director Jordan Vogt-Roberts recently teased another movie he wants to make happen within this franchise, a spin-off centering on John C. Reilly's character, Hank Marlow. If you haven't seen Kong: Skull Island yet, there will be some mild SPOILERS below, so read on at your own risk. Fans first meet Hank Marlow in the opening moments of the film, with Hank as an American fighter pilot engaged in a dogfight with a Japanese pilot Gunpei Ikari (Miyavi), who both crash on Skull Island. They both discovered the incredible creatures this island contains, and spent the next several decades becoming close friends while living on the island. Cinema Blend spoke with Kong: Skull Island director Jordan Vogt-Roberts, who revealed that he wants to make a spin-off centering on Marlow's early years on the island. "I mean, all people are f---ing excited about the idea for Kong and Godzilla and Rodan and all those creatures clashing. I don't exactly know where the world's plans are. In fact, I keep joking that personally I'm more interested in doing a $30 million version of young John C. Reilly on the island. Just some weird, the odd-ball monster comedy with him and Gunpei. So I don't really know where they'd take it from here." It isn't known if this project will actually happen or not, but it certainly could be possible, especially since it will be a prequel to Kong: Skull Island and won't interfere with the continuity of this Godzilla & King Kong franchise. Legendary has already set up a writers room that will spawn future ideas for new Godzilla and King Kong movies after Godzilla: King of Monsters and Godzilla vs. Kong, but it isn't clear if this proposed spin-off will actually come to fruition through this writers room or not. 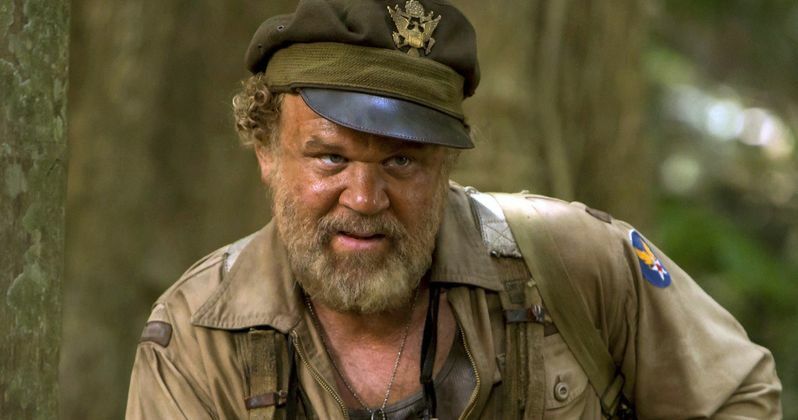 Since Kong: Skull Island has been a hit with both fans and critics alike, it's certainly possible that Warner Bros. could move forward with this John C. Reilly spin-off. Jordan Vogt-Roberts is rumored to take on a video game adaptation of Metal Gear Solid, but it still hasn't been confirmed to be his next film. If Kong: Skull Island keeps growing in popularity, it's possible that Warner Bros. could actually bring Jordan Vogt-Roberts back to direct this spin-off. Kong: Skull Island was written by Dan Gilroy, Max Borenstein and Derek Connolly, with John Gatins receiving a story credit, but it remains to be seen if these writers would be interesting in taking on a Marlow spin-off of Kong: Skull Island.